Railing planters help fix one of the downsides of living in an apartment in a big city (or any city for that matter). The “problem” is… you don’t have the room to make a sizable garden like you would have at a house. It may seem like a lost cause, but there is, in fact, a way to have a garden in an apartment! Railing planters are unique gardening aids which can hang from your railing, allowing you to plant many more plants than you usually would be able to. It could be a little difficult to grow upright vegetables… but flowers are a definite option! Read on for more. Railing planters are the ideal choice when gardening in small, outdoor living areas. These versatile containers help you make better use of limited space and add an attractive touch to any deck, porch, patio, or balcony railing. When you pick the right planter boxes for your railing, you can enjoy beautiful flowers and/or edible herbs, fruits, and veggies easily and affordably. The idea of a railing planter is not something new. Essentially it follows the same principles as what we know as a window box planter except fastened to the horizontal rail. Many a DIY deck builder has taken the steps to incorporate a deck rail planter box right into the design of their wood deck railing. In this article, we will discuss the various options available in railing planters and provide some sound information to help you enjoy success with this easy and interesting forms of gardening. Read on to learn more. Whether you own your home or are renting, you will surely want to avoid damaging your railings. Whether you have metal, wood, or plastic railings, keep in mind that bare metal brackets can cause damage by scraping. That’s why it’s smart to look for or design your planters with rubber or plastic-coated brackets. Be sure to provide ample space between the base of your porch or deck garden planter and the surface of your railing for good air circulation. If water sits on wood, plastic, resin, or metal for extended periods of time, staining, rotting, and/or rust will ensue. It’s also smart to add drain holes to the sides of your planters near the base to prevent water draining out of the bottom and collecting on top of your railing. With clever positioning of drain holes, you can use water that drains from one plant to water the plants directly beneath it. You must also be very certain that your railing planters are secure. This is especially true if you are gardening on a balcony! You don’t want your garden to come crashing down due to a slight bump or a high wind. Take great care to attach your planters securely to avoid property damage and possible injury. There are several different ways to prevent your rail planters from hurtling to the ground. Each method has its pros and cons. Some are well-suited to one application and not suited at all to another. Here are 5 ideas. It is possible to attach a planter to a railing using a chain or a rope, but this is probably the least desirable option in any situation. To do this, you would simply wrap the rope or chain in such a way that it encircles each end of the planter securely. You can use eye hooks screwed into the railing to secure the rope or chain. While this method may work for lightweight planters and might be a good stop-gap measure, there are a few reasons not to do this as a permanent solution. For one thing, it’s rather unsightly. If you attach your planter to your railing with rope or chain, it will not improve the appearance of your home. If you are renting an apartment, neighbors and management may complain. Lastly, it is not especially secure. Winds and jostling are bound to loosen your fasteners, and before you know it, your railing garden will go crashing to the ground. If you plan to use this method at all, you should consider it only a temporary measure to be used until you can devise something more attractive and sensible. For semi-permanent installation, you can just screw the planter to the railing. You should add feet to a flat-bottomed wooden, metal, or plastic/resin planter box to provide air space, and then drill a couple of pilot holes through both the base of the box and the feet to attach the planter to the top of the railing. You can also use screws to attach wooden, metal, plastic, or resin planters to the sides of railings. Be sure to drill pilot holes first to prevent splitting the material as you work. With metal, plastic, or resin planters, it’s a good idea to use washers equipped with rubber rings to add extra support and security. This will help minimize wear and tear due to wind, weather, and the sheer force of gravity. If you want to avoid damage to your railing and/or you need to move your planters from time-to-time, brackets can be very useful. Metal brackets may be “L” shaped to hang plants on one side of the railing, or they may straddle the railing to hang plants on both sides. Some brackets provide for planters to be attached using screws. Others simply have hooks that allow you to attach, remove, and interchange planters with ease. Brackets made of powder-coated steel resist rusting and wear. By far the best and easiest alternatives for railing planters are prefab straddle containers like the Bloem Modica Deck Rail Planter. These boxes are specially designed to straddle a standard-sized railing securely. They already have properly drilled drainage holes and built-in air circulation space. They come in a variety of attractive colors, sizes, shapes, and styles, and you can move them about and rearrange them as you wish. If you move, just pack them up, and take them with you. These planters are typically made of heavy-duty plastic that should last forever with proper care, so they are well worth the reasonable price you can expect to pay. If you are handy, you can build a 3-bin railing planter using outdoor quality plywood. This unique design provides three generous planting spaces: One rests on the rail, and two others provide ample planting space on each side of the rail. This planter simply sits securely on the rail without attachment. You will not need to drill any holes to put it in place. Remember to add footing under the center planter to provide air circulation and help prevent railing damage. Place drainage holes on the low sides of the center planter so that it will drain into the two side planters. What’s the Best Material for Railing Planters? You will find planters available in plastic, resin, wood, metal, and basket styles that you can line with coco coir. These have pros and cons depending upon your setting and the type of plants you wish to grow. Metal can be attractive, but can leak into the soil and may be harmful to your plants. Additionally, it can wear and rust badly, and can become scalding hot when exposed to the sun. If you are going to use metal containers, be sure to also use planter box liners and place these planters in shady locations. Metal bucket planters like these are colorful and versatile. Wood is a classic choice that is always attractive and is typically safe for plants. You must be sure to choose durable, outdoor quality wood or your planters will deteriorate rapidly. Hardwoods such as cedar, eucalyptus, and Brazilian walnut (aka Ipe wood) are good choices. Outdoor treated plywood can be a suitable choice, but you must be sure it is not treated with anything that would be toxic to you if you are growing veggies. This 20″ Rectangular Rustic Wood Planter has a Plastic Liner. Plastic and resin are durable, colorful, versatile, and do not become dangerously hot in the sunshine. Although these materials are not a very ecologically sound option, you can mitigate the environmental impact of your choice. If you buy with care by choosing planters made of recycled plastic products, and then follow up by taking good care of your purchases so that they will last a long time, you can significantly reduce the carbon footprint of plastic rail planters. If/when your planters do break or degrade, be sure to turn them in for recycling so that they do not end up in the ocean or cluttering up the landfill for all eternity. DIY Planters! If you are crafty, you can make different styles of planters for use on your railings and throughout your home and garden with hypertufa. This is a lightweight, durable DIY concrete-like substance that you can easily mix up to form into any kind of planting container you want. Hypertufa containers are attractive and extraordinarily durable. If you are strapped for money or simply want to reduce the amount of garbage you toss out, there are a lot of household items you can use as railing planters. Here are a few smart ideas that can save you money and add creative interest to your railing garden. Large yogurt containers can be painted or otherwise decorated to make attractive planters for herbs, succulents, and small flowering plants. Just drill a few holes in the bottom for drainage, decorate, and plant away. These mini-railing planters are handy because they fit nicely on the typical railing. They come with their own drip saucer (the lid), can be moved about easily to prevent damage to the railing, and if they fall, they won’t do much harm. You can also drill 3 or 4 holes near the rim and thread durable string or wire through to make a hanging planter. Hang these mini-planters between the slats of your railing to even further increase your growing space. Gallon milk jugs can make very nice railing planters since you can use the handles to secure the jugs to the inside of your railing. To do this, you will need a dowel or steel rod slim enough to slip through the handles. You can secure this pole to the inner side of your deck railing using hooks that are large enough to accommodate the diameter of the pole. You’ll need to affix these hooks every two or three feet to support the weight of your milk jug planters. To make each individual planter, cut out the upper area of the jug where the spout is located. Remove this area in such a way as to leave the handle intact while opening the greatest surface area in the top of the jug. There is usually a ridge around the top area that can act as a guide. Remember to drill several drain holes in the bottom of each jug. Once you have enough milk jugs to fill your space, plant them as you wish and slide them onto your supporting dowel or rod. Put the rod in place using the hooks you have installed. This arrangement can be moved, altered, and rearranged as you wish. Make small, individual planters using creative cast-offs such as colorful rubber boots. A single screw with a washer driven through the upper back portion of the boot’s shaft will secure it to the side of a wooden railing. A row of brightly colored rubber boots planted with bright flowers, herbs, and veggies is a charming sight. Remember to drill a few holes in the soles for good drainage! Stray kitchenware such as cups, mugs, and bowls can make suitable mini-planters for small succulents and bromeliads, which can live outdoors in warm weather. Because these containers don’t have drainage holes, it is not a good idea to use them for plants that need a lot of water. Instead, layer pea gravel, activated carbon, and a sandy planting mixture to accommodate small succulents. Water sparingly to prevent root rot. If you have a shady, sheltered outdoor area, you can use these containers for growing bromeliad plants; simply fill the container with decorative moss and place the air plant artfully. Mist it daily. Remove the bromeliad and soak it in filtered water about once a month to give it a good drink. In wintertime, bring it indoors. Evaluate your environment. Determine how much sun, wind, and rain your balcony, porch, patio, or deck receives and plan accordingly. If the area gets a punishing amount of hot sun, you will need to provide some shade, even for sun-loving plants like tomatoes. Harsh, scorching sun is unpleasant and dangerous for your plants and for you. Umbrellas and shade sails can help control the amount of sun your outdoor living area receives. A trellis covered with rugged, sun-loving climbing plants can provide natural shade. Examples include ivy, grapes, honeysuckles, and climbing roses. These can all do well with hot sun once established, but you will need to provide them with a bit of protection while they get established. If you have a hot, sunny environment, be sure to choose your plants and planters accordingly. Choose heat and sun-loving plants and keep an eye on them for signs of overheating and scorching. Understand that you will need to take extra care to be certain your plants get enough water. This is where adding a spaghetti tube drip irrigation system is a smart move. Add a thick layer of mulch to the surface of your pots to help conserve moisture. Avoid use of metal containers or dark-colored containers in an extremely sunny setting as these can heat up dangerously. On the flip side, if your outdoor living area is shady, you will need to choose shade tolerant plants or plants which thrive in the shade. In this sort of setting, you can make good use of attractive metal railing planters and/or coco coir-lined baskets. If you are bound and determined to grow food crops such as tomatoes in a shady setting, try planting trailing vines (e.g. cherry tomatoes) in hanging or upside-down planters you can moved to catch more sun elsewhere. You should water sparingly to prevent root damage caused by water logging and to prevent mess and trouble. If you live on an upper floor of an apartment building, your neighbors below will not be happy if you over water and they end up with dirty plant water pouring onto their balcony. To prevent this problem, there are a few things you can do. Be sure to water your plants regularly to prevent the soil from drying out. Very dry soil does not absorb moisture well and water will just run right through. Wherever possible, position your garden in such a way that plants needing less water are below those needing more generous watering. When you do this, the runoff from the upper plants can be caught by the plants in the lower level. Position drip trays below your plants to catch runoff water. Keep a thick layer of mulch on the surface of all your plantings so that water will not evaporate too quickly. 5.. Check the soil regularly by poking it with your finger. If the top inch feels dry, you should water moderately. Take special care to keep your plants well-watered when it is windy or very sunny out. You may wish to move them off the railing during this kind of weather to give them some protection from the elements. Personally, instead of planting directly in the railing planter I like to use them as “plant holders.” By doing this you can use the 5 gallon bucket method of watering! Get yourself a 5 gallon bucket and fill it with about 3 gallons of water. I like to add about a tablespoon of water soluble fertilizer as well. Then take each plant and submerge the entire rootball in the bucket and allow all the air pockets to become filled with water. Allow the water to drain off and replace the plant back into the plant holder. Your railing garden is a captive audience. If your plants cannot get what they need from the soil in their pots, they don’t have the option of spreading their roots in search of better nutrition. Be sure to begin your garden using a high-quality container mix like this. Augment this with aged compost and water-saving crystals. Be sure to provide a layer of drainage material such as coarse gravel or Styrofoam peanuts in the bottom of your planters. This will help prevent root rot. Styrofoam is really the better choice in this instance because it is lightweight. Repurposing it in your planters will help keep it out of our landfills and waterways if you dispose of it properly when the time comes. Once you have planted your garden, give it a good watering, and then top it off with a thick layer of mulch to help hold the moisture in. Container plants tend to use up their resources quickly. Choose a good, all-purpose container plant slow-release fertilizer to ensure your plants are getting the nourishment they need to survive and thrive. Follow packaging instructions carefully. Or as suggested above apply liquid water-soluble fertilizer and fertilize when you water your plants. What Are Some of The Best Choices in Plants for Railing Gardening? Because of limited space, you don’t want plants that tend to run rampant. Major ramblers such as melon and squash are not good candidates for a railing garden or any container garden. Alliums: Onions, garlic, shallots, and leeks grow well in pots. They have pretty flowers and add flavor and nutrition to your daily diet. Trailing plants: Peas and beans can be grown in a railing garden as trailing or climbing vines. Some produce very pretty flowers followed by tasty edibles. Chili pepper plants tend to stay smallish, so they can do well in a railing garden. Chilis are flavorful and extremely good for you in terms of improving circulation and keeping inflammation (e.g. arthritis pain) at bay. Strawberries do well as railing plants. Leaf lettuces of all types are excellent choices in railing planters. Butter lettuce, romaine, red leaf, and others are colorful and flavorful. Rather than waiting for whole heads to develop before harvesting, plant densely and harvest on a regular basis by trimming leaves. This will allow you to reap a tremendous yield of fresh lettuce throughout the growing season from just a few plants. Small flowers such as marigolds, pansies, petunias, dwarf zinnia, geraniums, and the like all flourish in railing planters. Don’t forget the million bells plant for lots of flowers. Shady, sheltered porch, balcony, and deck settings make an ideal warm weather home for ornamental succulents (aloes, jade plant, hen & chicks, ice plant, etc.) and even bromeliads (air plants). In wintertime, move these indoors to brighten your bathroom setting! Expand Your Growing Area and Improve Your Home and Your Life! If nothing else, having an attractive porch, deck, or balcony railing planter display can really increase the curb appeal of your home by transforming it into a welcoming and attractive destination. Food gardening with containers is a satisfying pursuit, and you are sure to be surprised by how much food you can produce in a limited space. When you make the most of what you have by using your railing space to grow food, you can save a great deal of money and improve the quality of your diet. Another good reason to plant on your railing is accessibility. The top of a porch railing is just the right height for easy access without reaching, stooping, or bending. Adding planters to the railing makes gardening accessible to seniors and others who may have mobility issues. Railing gardening is a great way to add interest and activity to every day and expand and improve quality of life. The focus of this article has been on railing planters themselves and some of the different planters types and materials available. From years as a commercial plant grower I understand how topics can cause all types of different discussions. For example, attaching a deck railing planter in a backyard is much different and requires much less “attention to detail” than attaching a balcony planter to a steel rail 20 stories in the air at a condo. As you move up in the air, care takes on a different aspects as well. Dealing with more wind, more heat from concrete and what happens with excess water, all become something to consider. Plants and garden planters can add some much to a landscape and patioscape. This includes attaching planters to the railing of a rooftop balcony or a deck at ground level. One the things we hear most from people who love living here in the Ozarks is that they love the natural beauty that surrounds the cities on every side. We would have to agree with that assessment. There’s nothing like a gorgeous Autumn view in the Greater Springfield area. There are lots of awesome homes for sale right now that offer breath taking views to their future owners. Let’s take a look at some homes for sale in Springfield, Missouri that have million dollar views! WHO KNEW??? This Frank Lloyd Wright inspired custom home nestled on 25 acres in Rogersville and only 25 minutes from Springfield area is a hidden OZARK gem! 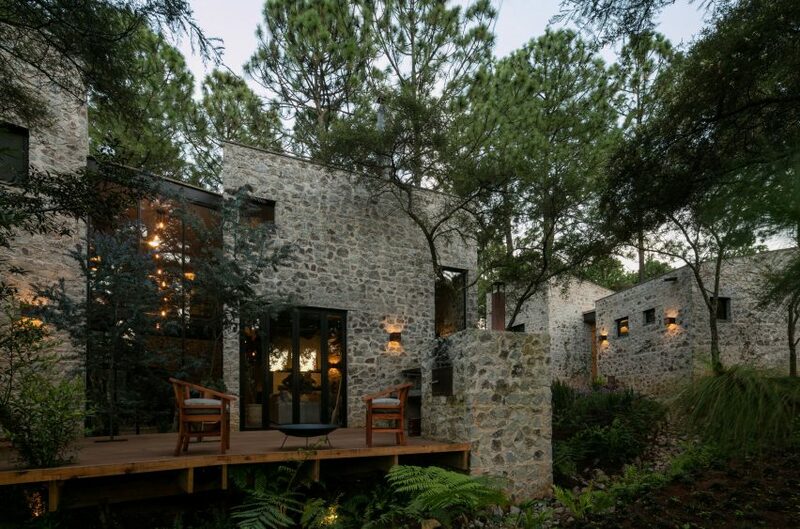 Stunning windows bring the outdoors in literally from every angle… the lush gardens and woods, the heatedinfinity pool and the view inspired deck… exceptional! Every detail has been thought of to make this a getaway retreat like no other! Private master suite w/ own screened in porch and VIEW! Guest quarters with full bath and VIEW! Private den and family living room w VIEW! 3400 Sq. 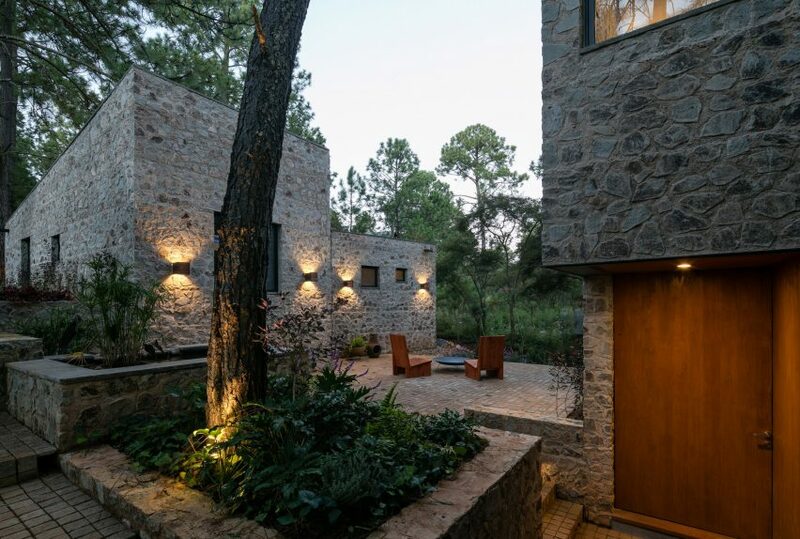 Ft. on one level w exceptional outdoor retreats, gardens and walking path to the lower landl. 50 year shingles, concrete board siding, hand-laid Arkansas stone walkways. Spotless, exceptional and breathtaking! One-of-a-kind getaway! This 5-acre property overlooking the James River Valley offers a million dollar view for half the price! Build your dream house in an idyllic natural setting while still being 5 minutes from the conveniences of Springfield. In addition to breathtaking views, the property includes living quarters, a workshop with Craftsman toolboxes, and a garage with space for 1-car and 1 RV/boat. The property is ready for building with a new well and new septic and electrical systems. The 900-sq.-ft. living quarters features tasteful decor, including white kitchen cabinets, granite countertops, stainless steel appliances, gas stove, whole-house water filtration system, tankless water heater, wet bar and Anderson windows. Here’s your chance to live in an upscale condo in the heart of Springfield! This lovely 2-bedroom condo has been completely remodeled. It features custom cabinets, granite counter tops, stainless steel appliances, crown molding, beautiful light fixtures, newer carpet, tile, and hardwood flooring and 2 bathrooms. The private balcony overlooking historic Walnut Street provides front-row seats to spectacular sunsets and a perfect place to enjoy your morning coffee. In addition, this prestigious high-rise offers many sought-after amenities, including 24-hour security, fitness room, outdoor pool & entertaining area, community room and secure underground parking. This is luxury living at its finest. Located in the fabulous Jones Spring area, this custom Mike Dobbs home, is a one of a kind showplace. Nestled among mature trees, this privately gated property features an in-ground pool with separate cabana house plus totally separate guest quarters with full kitchen and bath that was professionally remodeled and updated in 2017! The home features 4 fireplaces, high ceilings with an extensive use of wood beams, reclaimed wood floors and antique doors. Beautiful open living spaces plus large screened porch and patio with brick pavers. Other special features include a control 4 whole house audio system, new roof over garage and guest quarters in 2017, new pool liner in 2018, whole house generator.Truly a gorgeous property for the buyer that appreciates attention to style and detail. Exquisite finishes & details on this custom beauty! Over the river and through the woods to this amazing gated subdivision with river access! The Timbers at Riverdale offers this lavish story and a half retreat that is your dream come true! Features include:Hardwood flooring throughout main level, granite counter tops in kitchen and baths, two story foyer with grand staircase, and access to study & formal dining, extensive mill work thru out, bright with natural lighting! Master suite has cozy fireplace, and a wall of windows over looking the greenery and river beyond. Double vanity, and whirlpool tub. Be ready to entertain, Chef’s kitchen with modern flare, white cabinetry, beautiful granite! This 5 bedrooms, 4 baths, 6 car garage (3 car detached with home office) on 5 acres, Nixa Schools!An additional 6.2 acres that neighbors subject property, and with Finley River frontage, is also available for sale! Enjoy 8 acres of common area and river access with the purchase of this property! Bon fire night has a new meaning at this home, with near by natural spring and river access just below property! If you are thinking about building your own custom dream home, you need to view this property first! Magnificent gated all brick/stone walkout basement home nestled on a lush 10 acres with pond. This 5473 square foot home features a split three bedroom, three full bath floorplan with room for additional bedrooms in the full basement. This home features a large kitchen complete with granite countertops, under cabinet lighting, eat-in kitchen dining, pantry, Hickory cabinets and bar area adjacent to the wrap around deck to the master suite. Impressive open living room with cathedral ceilings leading into the formal dining room. The master suite is complete with dual vanities, walk-in shower and large walk-in closet. The basement features large rec room, the third full bath, study/office, family room with gas fireplace, wet bar, pool table/game room, three seasons room. The home also features a 18 x 36 pool with new lining, filter and pump, pool house, large patio with fire pit which overlooks the stocked pond, decorative fountain, gazebo, Bocce Ball & Texas horseshoe courses and a hot tub/sauna house perfect for entertaining. The back portion of the land has a covered RV parking pad, three car attached garage, generator hookup, an all brick 30×48 brick garage/workshop plus a NEW roof, gutters/downspouts on the home! Don’t miss this one!!!! Custom one owner home secluded in 160acres+/- of woods, pastures, ponds, springs, parklike yard. 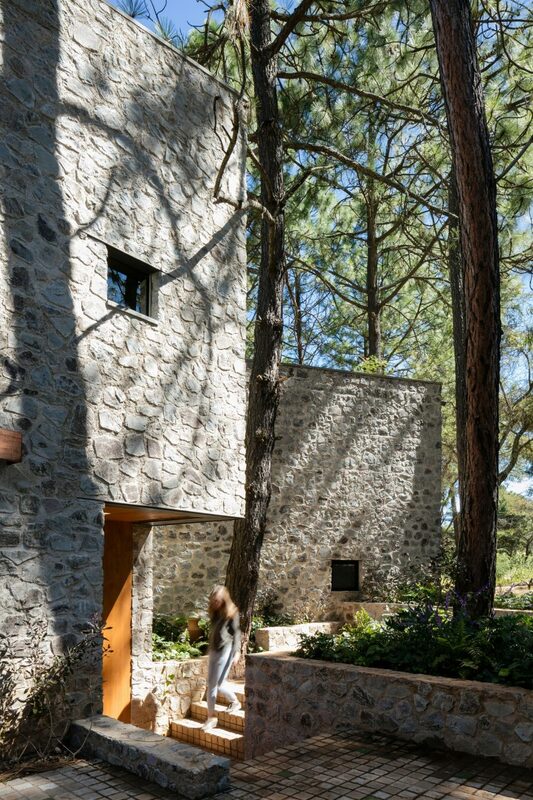 A Frank Lloyd Wright inspired home with features unlike any other home. As you enter, the Kalwall Skylight sets the mood for this contemporary home. Chef’s kitchen is a culinary delight, features corian and soap stone counters surrounding cherry cabinetry and bamboo hardwood floors . Bonus room and lower level complete for 2nd family living . Office and sunroom have atrium doors to master suite and decks overlooking waterfalls, ducks and ponds. Estate includes shop buildings, horse barn, and high tensile fencing and water lines for rotational grazing, and wooded trails. Good location close to town. Custom built home. Spacious plan with 4686 sf. finished living space and over 1000 sf. unfinished storage; half which could be converted to more living space. Quality construction with 2 x 6 walls, hardwood flooring, soaring ceilings, walls of windows and two levels of decking including a large screened deck to enjoy the beautiful mountain views. Master BDR, Great Room, Formal Dining and Kitchen / Dining combo are on the main floor. Master Suite features mountain views, a glamorous master bath with walk-in shower, double vanity, jetted tub and dual walk-in closets. Large laundry is adjacent to master suite and has secret entry door. 2nd level has 2 BDR, bath and a loft office. Walkout basement has 4th BDR, Fam.Rm, Workshop/John Deere room & storage. Located In Beautiful Sommerset Place!!! (A Gated Subdivision with less than 10 Homes!) This Luxurious One Of A Kind Home features 5 Bedrooms,9 Bathrooms and a 4 Car Over Sized Garage!!! Great for Entertaining the large covered patio overlooks the amazing saltwater infinity pool complete with 2 fire pits that are breathtaking! Across the pool you’ll find a 1000 Sq.Ft. Cabana that’s (NOT) included in the Sq.Footage of the Home!!! Counting the Cabana that would be a total of 8200 Sq. Feet of Paradise under roof! This property is a Must See and the amenities are just too numerous to mention! Enjoy Table Rock waterfront living at it’s best from your custom built true Log Cabin Home. From the 2 story Great Room featuring native wood motifs and slate floors, to the hand built cabinetry, Amish Craftmanship is obvious throughout. Enjoy your lake view from a covered wrap around veranda. Boat Slips are available from a 3rd party. Nestled in the gated area of Saddlebrooke is a stunning, prairie style, home with over 5,500 sf. It is extremely energy efficient and has the possibility of LEED certification. It has breathtaking views of Bull Creek from the 2nd level of the home and views of the rolling hillsides from the front. The walls and ceilings of the home were constructed with Structurally Insulated Panels (SIP). The panels offer an insulation value of R49 on the roof, and R26 in the walls. Throughout the home there are beautiful, unique, light fixtures creating a warm ambiance. An abundance of creative cubbies helps with decoration and furniture placement. The home features a master and laundry area on the main level as well as the 2nd floor. The main level offers a great room with a wood-burning fireplace accented with rustic wood beams. Behind the fireplace is an open family room that walks out to the lower deck. The office opens to the family room on the main level. The kitchen features a Professional Grade Viking exhaust hood above the gorgeous wood top island and a walk-in pantry. The adjacent dining area is large enough to hold a formal dining room table if necessary. . It offers 2 built-in gun cabinets and open access to a wet bar for your morning coffee or juice. The master bedroom sitting area offers access to a private deck. The deck offers a perfect spot to observe the wildlife and nature around Bull Creek. The unique ”Estate” hosts three separate living quarters within a private courtyard setting. Unsurpassed beauty sequestered in a story book setting, this ”Compound” overlooks Capp Creek, a year-round creek, and its historic dam and grist mill. Centrally located to many metropolitan areas, with a total of 18,000 sq ft of structure/8,456 sq ft interior living, with 8 bedrooms, 7 full/6half baths, 3 kitchens, 6 wood burning fireplaces, 10 garages, plus a beautiful indoor swimming pool and views from every window.The ”Nature” continues with a 720 Acre Conservation Area adjacent to this exclusive ”Compound” as well as a year round river stocked with troutThis breath-taking ”Estate” is perfect for a family with its privacy and/or a family who may wish to have guest quarters and/or care taker facilities. It is also ideal for the hunting/nature enthusiast – a dream come true. When it comes to understanding just what is included in a warranty and what is not, fine print can get really confusing. A hardwood flooring warranty can be a great selling point for a particular product. However, all too often consumers get caught in the middle if a problem occurs down the road and these warranties weren’t properly explained at time of purchase. Hopefully, we can clarify some of the basics of hardwood flooring warranties here. There are a few different types of warranties when it comes to hardwood flooring. Perhaps the most important one is the Structural Warranty. With reputable hardwood flooring manufacturers, you’re apt to find that most hardwood flooring products will carry a Limited Lifetime Structural Warranty, which applies to both unfinished and factory finished flooring. Structural Warranties guarantee that the hardwood flooring planks are stably sound and won’t crack, split or warp when installed properly. It’s always important to follow the specific manufacturer’s prep and installation instructions, as installing hardwood flooring improperly could possibly void the warranty. Grade level (1st floor vs. ground level vs. basement), subfloor type and radiant heating systems can also be problematic for certain products, so you need to make sure the flooring you choose is approved for your particular room conditions. It’s not unusual for some manufacturers to demand the installer use their specific installation accessories (tools, underlayments, etc.) during installation to avoid voiding a warranty. It’s important to follow instructions for subfloor prep as well, as one of the major and most common situations where the Lifetime Structural Warranty is no longer valid is in a setting where there is a higher moisture content than recommended for that specific manufacturer’s hardwood floor. Moisture is the number one reason for hardwood flooring to start performing badly (warping, buckling, cracking, etc.). Manufacturers know this and will quickly dismiss a claim where excessive moisture had a chance to get at the boards. It’s better (and cheaper) to be safe than sorry and have to replace your entire floor just because proper precautions weren’t taken prior to installation. Finish Warranties are a little bit different than Structural Warranties, as most of the time there is a specific number of years time limit on how long the Finish Warranty is valid for. The standard in the hardwood flooring industry for a Residential Finish Warranty right now is about 25 years. Although, with improving technologies, many hardwood flooring manufacturers are upping their Finish Warranty periods to 35 Years (Lauzon Designer Collection), 50 Years (Somerset Floors) and even Lifetime Finish Warranties (Award Floors). A Finish Warranty can be a bit confusing for some consumers, as it implies a lot more coverage than it actually has. A Finish Warranty won’t cover scratches, dents, gouges or damage to the finish caused by moisture. The basic principle of a Finish Warranty is that it guarantees the factory applied finish will not wear off in the time period stated when used in areas with standard residential traffic. 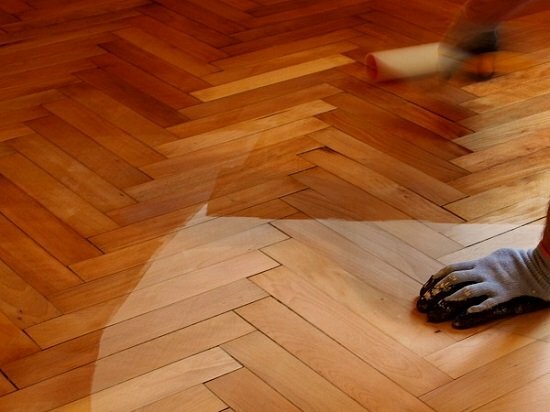 It’s kind of obvious, but still needs to be said: if you sand and refinish your hardwood flooring at any point, you’re automatically voiding the Finish Warranty. Why? You’re taking off the finish and that’s what the Finish Warranty is covering. To avoid scratches and the urge to refinish your hardwood flooring too soon, just make sure to keep it clean and use chair glides on all furniture legs. The major cause of hardwood flooring surface damage is when heavy things are dragged across the surface of the floor. As mentioned previously, scratches aren’t covered by the Finish Warranty, but shallow surface scratches can be somewhat fixed with the use of a touch up kit. A Commercial Finish Warranty covers just what its name suggests: use in a commercial setting. The guarantees are the same as with a Residential Finish Warranty, but usually Commercial Finish Warranties cover fewer years because commercial settings (offices, restaurants, etc.) experience heavier traffic. Although top manufacturers invest a huge amount of money in Research & Development, making sure that the flooring stamped with their brand name is stably sound and a quality product, it’s not a perfect world and sometimes hardwood flooring has legitimate structural or finish issues that do fall within the limitations of the Structural or Finish Warranty. If you’re experiencing an issue with your hardwood flooring and decide to file a claim, in most cases, the manufacturer will tell you to contact the retailer from whom you purchased the hardwood flooring from. The retailer will act as a liaison between you and the manufacturer, relaying information about the problem you’re experiencing. It varies from manufacturer to manufacturer, but usually if a claim is accepted, the manufacturer will reimburse the end user for material and labor costs. All in all, if there is a problem with your hardwood flooring, the manufacturer probably already knows about it because, chances are, other similar claims have been filed, investigated and approved. Not all claims, however, are verified and accepted by manufacturers. As mentioned previously, moisture issues are the leading cause of damage to hardwood flooring and are not covered by the warranty. If a manufacturer needs more in depth evidence that the problem was caused by the actual flooring itself and not improper installation of their product, they will insist that you have an independent inspector come out and determine cause of failure. To the left is a photo of an installation that was inspected for a homeowner in the area. You can see that the boards are cupping and bowing up, creating a sort of wave effect throughout the room. An inspection determined that there was an existing moisture problem with the subfloor that should have been addressed prior to installation of the hardwood. The report was submitted and the warranty claim was dismissed because the manufacturer’s installation instructions, which included a required subfloor moisture content check, were not followed properly. There was nothing wrong with the actual flooring, all the damage was moisture related. A Structural and Finish Warranty can be a good gauge as to whether the manufacturer of the hardwood flooring you’re interested in stands by their product. This somewhat attests to the quality of the product. But, should the warranty time period cause you to choose one product over another with a warranty period of fewer years? It’s hard to say for sure, but there are a lot of other aspects of hardwood flooring that should more importantly drive the decision to purchase: wood species (different hardnesses mean different durability levels), color (does it match the aesthetic you’re going for? ), construction (solid vs. engineered), etc. Ultimately, the warranty offered with a hardwood flooring product should be considered when making a purchase, but make sure you understand what’s included in the warranty and what is not before you let an attractive flooring warranty confuse you. It’s that time of year again to set goals that clean up bad habits and create new attitudes. But with more than half of all New Year’s resolutions failing, we suggest setting some that you’ll want to keep – goals to up your joy and happiness by simply spending more time outdoors. We have a few resolutions we think might do the trick. 2. Fuel the passion within. Relaxation comes in the form of comfy blankets, mugs of hot chocolate, gathered around a roaring fire pit. Our top 10 fireside decks inspire you to aspire. 3. Pencil in some “me” time. Follow Trex on Instagram and let the beauty of our outdoor images soak your thoughts and erase the day’s hard moments. 4. Embrace the unknown. Knowledge is power and our cost calculator provides just the numbers you need to answer questions and move you closer to the outdoor space of your dreams. 5. Be kind to your skin. Enjoy your outdoor retreat while staying protected from the UV rays with the perfect amount of shade provided by a Trex® Pergola™. 7. Nurture your green thumb. Satisfy your need to be one with nature and plant a cascade of color in our beautiful made in part with eco-friendly recycled material. 8. Get messy every now and then. Our low-maintenance decking lets you unleash your creativity and then follow it up with peace-of-mind, easy cleanup. 9. Recycle, recycle, recycle. There’s no better resolution than one that makes positive impact on our planet. Gather your plastic waste, donate to our film recycling program and know you’ve done your part to protect our world for years to come. Why live your life inside, shut away from the beauty of the outside world, when you could live your life outdoors instead? When you create an outdoor space for your home, it doesn’t only have to be an area where you grow a few flowers or occasionally sit out in the sun. There’s so much you can do with your outdoor space to promote outdoor living and create the perfect place to relax, socialize, eat and drink, and more in all weathers. Successful outdoor living requires careful thought about how to set up your space so that it works for you and suits your tastes. Outdoor living shouldn’t just be for when it’s warm and the sun is shining. If you want to make the most of your outdoor spaces, you can think about how to make them more suitable for a range of weather conditions, whether it’s the most beautiful summer’s day or the middle of winter. Adding any kind of cover to your space will help to make it more suitable for rain and snow, and provide you with shade when the sun is out too. You might also think about adding some things to keep the space warm, such as a fireplace or some outdoor heaters. Water management is also essential if you want to avoid the buildup of stagnant water. Techo-Bloc permeable paving helps to direct water into the ground or into temporary storage in the base structure. Creating the perfect place to socialize is an important part of outdoor living, but you probably want somewhere you can find peace and tranquility too. If you want to create the perfect place for socializing, you should start by considering paving such as a patio or elevated patio that will set you up with an even and attractive surface to work with. One of the ways to create a space that works for both socializing and getting some peace and quiet is to think about different seating options and perhaps creating different zones within your outdoor space. 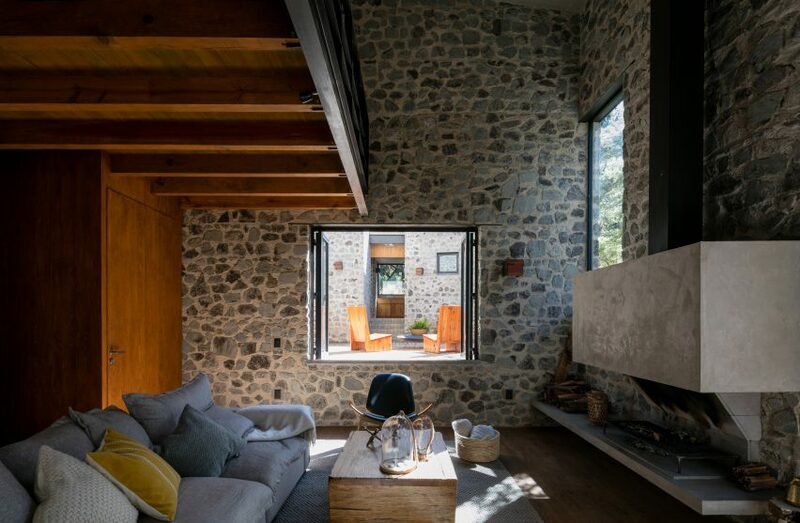 You could have anything from stone benches to sofas and dining spaces. Eating outside is one of the great pleasures of outdoor living. And not only can you eat outside but you can cook outdoors too. An outdoor kitchen is definitely something you should consider, whether it means installing a wood fired oven or barbecue, or having a full kitchen space. Our products, including the Grill Island and Forno pizza oven can get you set up with essential and stylish appliances. Combining your cooking area with a kitchen garden is a great idea too. When it comes to other types of entertainment, think about adding technology to your space. Weatherproof televisions or sound systems can be fantastic additions. To enhance the feeling of living outdoors even more, creating a smooth flow between indoors and outdoors is a good idea. Using plenty of glass and perhaps bi-folding doors to open up the indoors to outside can help to increase the natural flow. Match up things like flooring, colors and even furniture too so that your outdoor space is in keeping with the style of the rest of your home. For fun outdoor living, you need the perfect space. Think about how you want to use your outdoor space to get it right. NEED HELP TO START YOUR PROJECT? DOWNLOAD OUR FREE BACKYARD PLANNING GUIDE! Building a custom home is one of life’s most rewarding undertakings. Given the resources, you can personalize your home, crafting it to suit your every need and desire. While every project is different, Mitchell Homes’ customers are always excited to plan and build the home of their dreams. Future custom homeowners don’t always know what they want, though. While all of our homes come with beautiful, durable, modern standard features, there’s no restriction on what we can craft. When customers contact us with uncertainty, we walk them through some of our most popular home upgrades for inspiration. Still, we won’t claim to satisfy every limit of the imagination with our pre-designed floor plans. We’re happy to build anything our customers desire, and we offer a whole host of custom upgrade options. Custom options include anything that is non-standard. While Mitchell Homes offers thousands of upgrade options, there’s no boundary to what we’re willing to build. 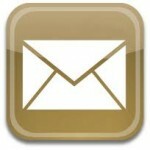 Our customers love finding unique custom upgrades on sites like Houzz and Pinterest and bringing them to us. If you can describe the project or show us what you want, we can make it happen! It’s no wonder that many of our customers want to focus their home renovations on kitchens and bathrooms. Kitchens are truly the heart of the home, a space where families and friends congregate to share food, drinks, and memories. Adding custom cabinets to your home carries a number of benefits. You can match your cabinet styles to your home’s design, create additional storage and organizational space, or add features such as glass-pane doors and internal lights to create beautiful showcase areas. What do people want? Hardwood flooring. 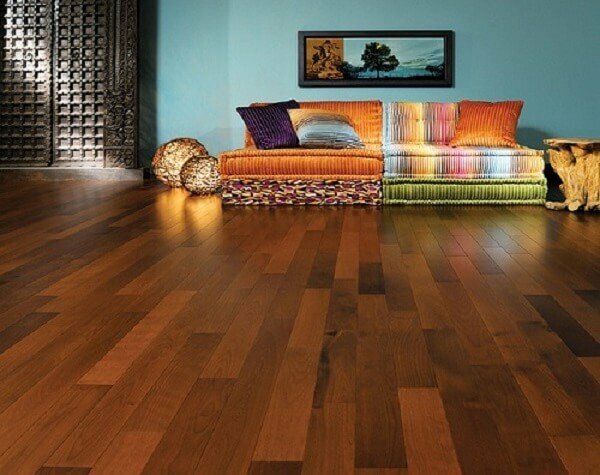 Many customers have always dreamed of adding the comfort and class of hard wood to their homes. With a variety of options from solid wood to engineered wood floors, we’ve got a personalized solution to match any home’s design. Hardwood isn’t your only flooring upgrade option, though. Hardwoods are perennially popular, but lately we’ve seen an influx of requests for laminate flooring and ceramic tile, especially in kitchens, bathrooms, mudrooms, and foyers. These classic and easy to maintain floors are perfect for families with children and pets. There’s no extent to the luxury that our customers desire in their master bathrooms. Bathrooms have a lot of small pieces that add up to an experience as indulgent as you’d like. Changing from a tub-shower combo to a roll-in shower and walk-in bathtub. Custom bathrooms are our specialty, and that certainly includes handicap-accessible bath fixtures to cater to the unique needs of our elderly or disabled customers. Upgrading to comfort height and water reducing toilets, faucets, and sinks. Water fixtures are small pieces of a puzzle that can come together to create a true luxury bathroom. Paving, including stamped patterned pavement for a distinct custom home exterior. These may be our most popular options, but they only represent the tip of the iceberg for what Mitchell Homes can create in your home! What upgrade options does your custom dream home include? For more inspiration, be sure to request a plan book from Mitchell Homes! A street in Saint Paul’s Cathedral Hill. Considered in another context, we recognize almost all of us live in places facing a street functioning in a practical role providing a means of travel to connect ourselves with the world around us. But for the purposes of this writing, for many of us in city neighborhoods, the street is where we live and the street, to some extent, defines who we are. Our streets form our communities where we mingle with our neighbors and share various collective values. We take for granted that these roles are our variation of citizenry. Put another way, our residential streets have become our outdoor living rooms. In American neighborhoods the preeminent form of public space is streets. We consider what is outside the street’s pavement to be the domain of aligned properties that often share a community-developed architectural code. Among these streets, people have gained generalized parity with cars, despite the fact that streets’ primary role is to enable cars to perform their primary role in transportation. When streets were originally platted in the late 19th century, vehicular movement was their almost exclusive function, with public sidewalks and boulevards very ancillary components determined by street engineering. Cities are becoming more attractive for various middle class domains. In the decades following the 1950s, de-industrialization has made more urban areas attractive. Smoke stacks and railroad trackage have largely disappeared from nearby residential neighborhoods. The move from urban to suburban has been reversing in the last several decades. Are there lilac trees in the heart of town? Can you hear a lark in any other part of town? Does enchantment pour out of every door? No, it’s just on the street where you live. Today, the street where we live has economic conditions. On one hand, homeowners are being handed massive public subsidies: the mortgage interest tax deduction and capital gains tax exclusion when the property is sold. With wider public consequences, various statistics state the cost of buying a home today is increasingly unaffordable to many potential homebuyers. A concern should be the long-term ability of millennials to buy a house. The desire of many urban home owners to find the right house has been accompanied, as well as complicated, by city planning regulations. Zoning was a response in the early twentieth century to the detrimental effects of industrial pollution. While it isolated factories from their noisy and dangerous activities; the car traffic and parking spaces in residential areas also increased, to which zoning has devoted considerable effort for enacting regulations. Many urban observers accept zoning while calling it in many ways an imperfect instrument. Compared to cities in the eastern regions of the nation, lot sizes in Minneapolis and Saint Paul are somewhat larger, resulting in more outdoor space around houses, giving light and air, and complementing trees on properties and in boulevards to create pleasant cityscapes. It is this notable ambiance that many realtors proudly advertise when they promise to find us the right homes in our urban communities — on the street where we live. Homes on Saint Paul’s West Side. “A camera teaches you how to see without a camera.” Dorothea Lange My professional experience includes over 36 years of architectural office experience, with the last 21 years as principal of Design For Preservation. My education includes a Bachelor of Arts degree in Art History, and five years at the School of Architecture, University of Minnesota. I served 21 years on the Minneapolis Heritage Preservation Commission and I have written articles for Architecture Minnesota, a publication of the Minnesota Chapter of the American Institute of Architects. I have given lectures on preservation architecture at the University of Minnesota School of Architecture and various public forums. Art photography is a main avocation for me, focusing on capturing images of abandoned parts of the built environment, and I have been featured in several art exhibitions. I have co-authored a book on County Catholic Churches and am the author of the book Milwaukee Avenue – Community Renewal in Minneapolis. Also, I am editor of the infrequently published Journal of American Rocket Science. My absolute hands down favorite flooring choice for a home is real wood, even more than engineered hardwood. I love the look and feel of real wood in a home, in family rooms, bedrooms, anywhere. Real wood has the warmest look and a softness underfoot that tile and vinyl can’t really compete with. But today I’m sharing my tale of woe regarding my hardwood floors, specifically in my kitchen. My kitchen addition was eleven years ago and I at the time I chose more traditional style cabinetry. If I was doing it again now I’d go with a different cabinet style like Shaker and quartz countertops not marble but that’s not the point. The focus today is on the hardwood flooring, more specifically, it’s impracticality in kitchens. Because I’m a lover of consistent flooring throughout downstairs community spaces, when we added this kitchen to the house eleven years ago I opted to continue the hardwood into the space for seamless flow. The truth is that over time we experienced water damage in this space on several occasions, first where that French door access has to the courtyard, next under the sink and dishwasher, and this month, under the icemaker. I’m not alone in this experience, my parents chose hardwood for their new build fifteen years ago and when their icemaker leaked a huge section of the flooring had to be replaced at great expense. I’ve heard other stories of water damage from friends and clients too because hardwood flooring’s greatest foe is water. Ever since I refinished my hardwood floors in a dark stain a year and a half ago I’ve been anxious about any water that spills on it, whether it’s from the dishwasher or the pet bowl or any moisture spill at all. Aaaaaand just last month, the icemaker started leaking and now look what’s happened to my beautiful floors… they’re buckling from moisture and I will need to have these boards replaced. This wood runs under under the cabinetry which means the cabinets and countertop next to the fridge have to be removed to adequately repair the floors. UGH. I have a client with a full house renovation right now and she also wanted hardwood in her home and for it to flow into the kitchen. When she asked what I thought I said to her “hell no!” Hardwood is great for foyers and living rooms and bedrooms and home offices or in any space where there’s little danger of water damage. However, hardwood is a terrible choice for kitchens, bathrooms, laundry rooms, or basements and if you install it in those spaces, you’re asking for trouble. Thankfully in these modern times we have really good alternatives that look just like wood! and I really love the look and feel of the luxury vinyl plank flooring in my upstairs studio rental (seen below). But never ever ever again would I install hardwood floors in a kitchen. If you disagree tell me why! Do you have hardwood floors in your kitchen? Have you experienced water damage or have you been able to maintain them over time? 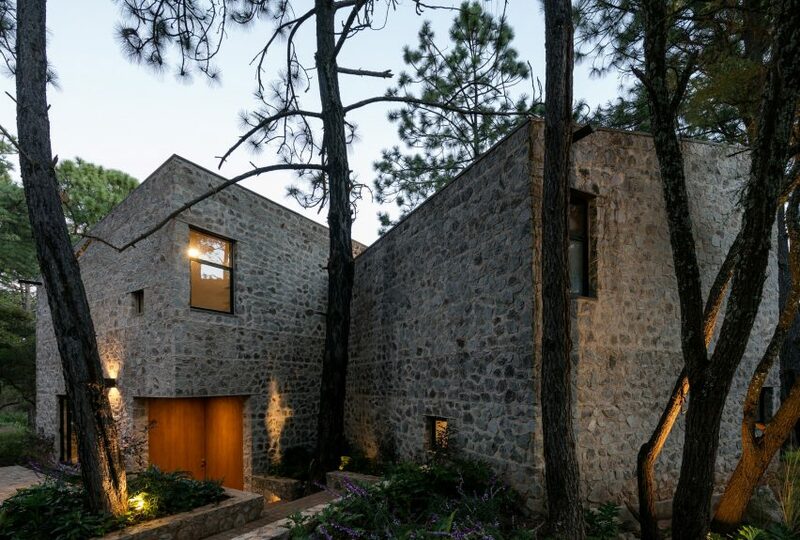 Mexican architects AM30 Taller de Arquitectura and Stephane Arriola have completed a vacation home in Jalisco, using traditional materials and aiming to disturb the site as little as possible. Many Arizona residents love the state for its abundant sunshine, but when June, July and August roll around, they’d like a little more shade and a little less sun. “It can be very hot here in the summer, but it gets more tolerable when you add shade, even if it’s 100 degrees outside,” says Tom Booth of Booth Built Patio Products, a Phoenix area company that specializes in installing shade structures. After living in a home for a couple of years, homeowners decide they want more shade than the builder of the house originally provided with the typical covered patio. They yearn for a little shelter in the morning when they’re outdoors sipping their coffee or in the early evening so they can dine outside and savor the blue and magenta sunset along with their grilled steak or salmon. According to Booth, the most popular idea for providing that shade is often adding an open-lattice pergola with overhead slats that throw shade but don’t greatly restrict natural light inside a home. The Latin word “pergola” traditionally referred to an outdoor structure of columns supporting a roof of rafters and beams. Sometimes it could be a latticed, free-standing roof covered with vines and plants. Today’s pergolas often have different shapes and designs but are often attached to the existing roof of a house or an existing covered patio. In the Southwest, we might call that pergola a ramada or a cabana. What material can a pergola be made from? Traditionally, they were made of masonry or wood. These days you can often buy inexpensive do-it-yourself pergola kits containing materials made of wood in big-box stores. But in the Arizona sunshine, wood likely will need repainting every year. Wood plus plastic composite materials like Trex may last longer but are more expensive. Booth uses an aluminum product — textured to look like wood and that will last for years and years. Do you have to have a building permit for a pergola? In most cases, you will need one from your local planning department even though the structure might be very small and doesn’t have any solid walls. After all, you might want to add electricity to a pergola or ramada for lights, fans or a sound system. A pergola also must conform to rules for setbacks from lot lines and similar regulations. “Any time some structure like a pergola is attached to your home, you’re probably going to need a permit,” Booth says. Can you build a pergola yourself? If you’re really experienced, maybe so, but it can be tricky. You might need do some design work to fit your landscaping. Or you might have to extend some paving from a patio and put in footings to support columns. The planning department permit requirements might make the job more complicated. However, pergola kits do include precut lumber or structural parts and hardware, in addition to instructions. Can a pergola be used as a roof and shelter for an outdoor kitchen? That’s possible, but don’t put in that outdoor kitchen located too far away from your house. In our experience the closer the kitchen is, the more likely you will use it. If you’re going to supply water, gas or electricity to a pergola, you may need assistance from an electrician or plumber. You may also want to install lighting, a misting system and a sound system. Another use for a pergola is next to a swimming pool to provide shelter and shade between laps. Are there other small structures you might add to a sunny yard to provide more shade? Think about trellises of wood, metal or plastic. Trellises, of course, are lattices often used as an artistic design element for gardens. But if you put a trellis in front of a wall of the house that gets a lot of intense sun, it can create shade to cool that wall, especially if you cover it with vines. Build the trellis a foot or two away from the wall so that it won’t interfere with future repainting and so that vines won’t cover the wall itself. Latticed arbors can also provide shade on walkways in a yard. But remember, it’s not good to have too much water sprinkling close to your house. Still, if you’re yearning for a little more summertime shade on your patio, a pergola or ramada might be exactly what you want. Carpet vs hardwood flooring — yes, this is a long-standing debate among homeowners as these two variants are, probably, also the most common flooring options. Although both the types are quite different from one another, you need to make the correct choice. Why? Because this decision will affect you for at least the coming 10 years. So, today, let us try to pit one flooring category against the other — based on some important attributes. After weighing all the pros and cons, we shall try to arrive at what is the best option to fit your requirements. What is cheaper to install carpet or wood flooring? Yes, the first factor is definitely your cost of installing the flooring. The average material and installation costs for carpet range from $3 to $5 per square foot, while for hardwood, it is approximately between $9-$14 per square foot. However, wood is durable and long-lasting. Therefore, if you consider the long-term costs, wood balances out its up-front investment over the years. Carpet vs hardwood flooring: Which one is easier to maintain? A hardwood floor — especially in a high-traffic area such as the living room — does not accumulate debris, dust, crumbs, or stains. You can easily wipe up anything with the help of a mop or a broom. But carpet tends to absorb particles and hence, it becomes very difficult to keep it clean. Most of the times, you won’t even notice that something has fallen on your floor. However, regular vacuuming and yearly deep cleansing can solve this problem. Does hardwood look better than carpet? Depends on your individual taste. It is true that wood looks luxurious, elegant, and sophisticated. It is the classic flooring choice for homeowners with a refined taste. However, nowadays, the choices in carpet styles are also so many! You may choose from several colors, patterns, and fiber types — including nylon, wool, olefin, or polyester. Now, whatever decision you take, remember that your product’s style stays in trend for the coming 5-10 years! Do wood floors increase home value? Depending on the type of wood used, premium hardwood floors can last up to decades. Just that you need to properly maintain them and undergo a refinishing project when they get damaged. Since wood is timeless, it does increase your home’s value in the real estate market. Good-quality carpet fibers also last 10-15 years, and sometimes, people prefer to keep changing the overall look of their homes. Carpet vs hardwood flooring: Which option is environment-friendly? Authentic hardwood — derived from renewable resources — is a natural material. Therefore, it lends a natural-inspired, timeless appeal to your interiors. Moreover, you can always plant a tree, but not reverse the negative effects of manmade carpet fibers. But then, in the case of carpets, you can also go for natural fibers — such as wool or recyclable materials — ensuring that you embrace the environmentally friendly way of life. It’s true that wood comes in classic natural color options. But if you wish to add some drama, simply throw in an area rug and you are all set! You can get rugs in a myriad of designs as well — ranging from fun elements to luxurious, sophisticated looks. In short, you gain the best of both worlds, correct? However, even carpets are versatile enough by arriving in a gamut of colors, patterns, and styles. If you want to alter the existing look, simply get a new carpet and install it. It won’t even cost you much! Are hardwood floors hard on your feet? You definitely do a lot of walking in some areas of your home, such as the kitchen, living, and family rooms. And sometimes, hardwood is hard on your feet. In this case, carpet — with its dense, soft layer — acts as padding for your feet. Again, if you own a hardwood floor, you can solve this problem by simply placing some rugs in areas which experience high foot traffic. Have you considered the insulation factor? Carpet is a good insulating material — thereby, lessening your energy bills and keeping your floor warm and comfy to tread upon. This is evident, especially during the colder winter months. In case of hardwood, you can tackle this issue by installing some insulation below your house. Hardwood and carpet — each of them have their own pros and cons. While the former is classy, durable, and strong, the latter is soft, comfortable, and warm. So cozy vs sophisticated — which one do you prefer? Choose wisely and let us know of your decision in the comment section below! 20989 Broadway in Sonoma is a three-bedroom with vineyard views. The Sonoma home sits on 3.35 acres and includes a chardonnay vineyard. Hardwood flooring graces the Wine Country home. The Wine Country home includes a mezzanine loft area above the living room. The living room features a vaulted, beamed ceiling with exposed trusses. The living room offers a wood-burning fireplace and a vaulted ceiling with exposed trusses. Hardwood flooring, wood-framed windows, and a vaulted, beamed ceiling accent the interior. The eat-in kitchens dining area features a contemporary chandelier. The kitchen opens to the backyard through a glass door. A French door refrigerator and terraced center island accent the kitchen. The kitchen features dual ovens and a subway tile backsplash. The owners suite includes a walk-in closet with custom built-ins. The master suites bathroom opens to the outdoors and includes a walk-in shower and dual vanities. Sliding doors open to this bedroom. 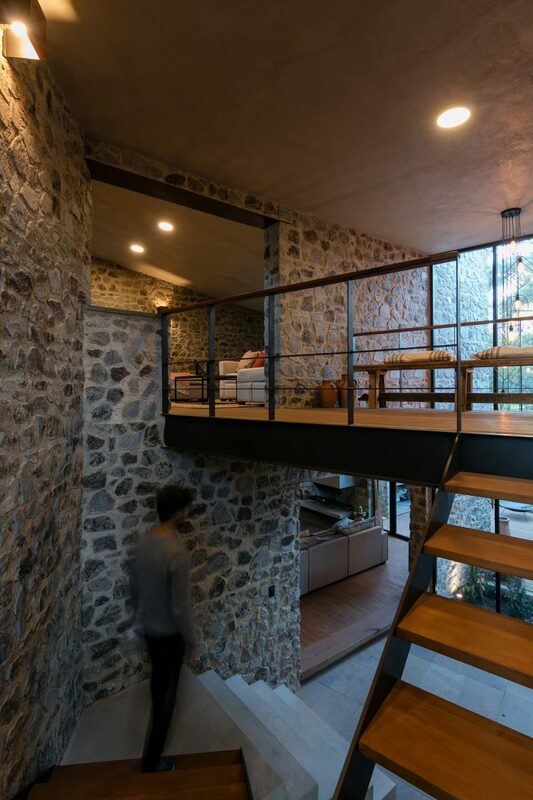 A hardwood staircase ascends to the loft. The loft offers an office overlooking the vineyard. The backyard features a sparkling lap pool. The 3.35-acre landscape offers plenty of room for entertaining. An aerial shot showcases the landscape and Sonoma home. The 3.35-acre landscape includes a chardonnay vineyard. Description: Less than 2 miles from Sonoma’s historic plaza, this three-bedroom country home sits on 3.35 acres. Hardwood flooring, wood-framed windows and a vaulted, beamed ceiling with exposed trusses accent the interior, as a mezzanine loft overlooks the living room. The eat-in kitchen offers a terraced center island, stainless steel appliances, and subway tile backsplash. An owner’s suite with a walk-in closet and spa bathroom opens to a patio. Don’t miss: The landscape. In addition to the Chardonnay vineyard, the home includes an inviting backyard with a shimmering lap pool and spacious patio. It also offers a horseshoe pit. 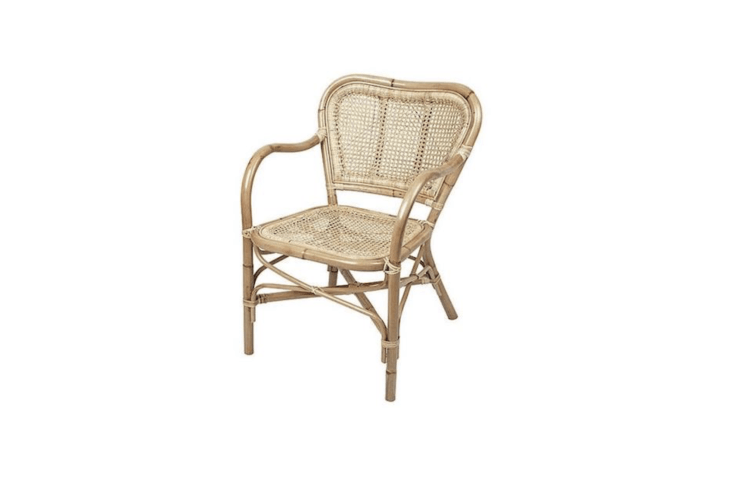 A comfortable rattan chair on a patio, deck, or balcony has a lot of power to sway you. Give into it. 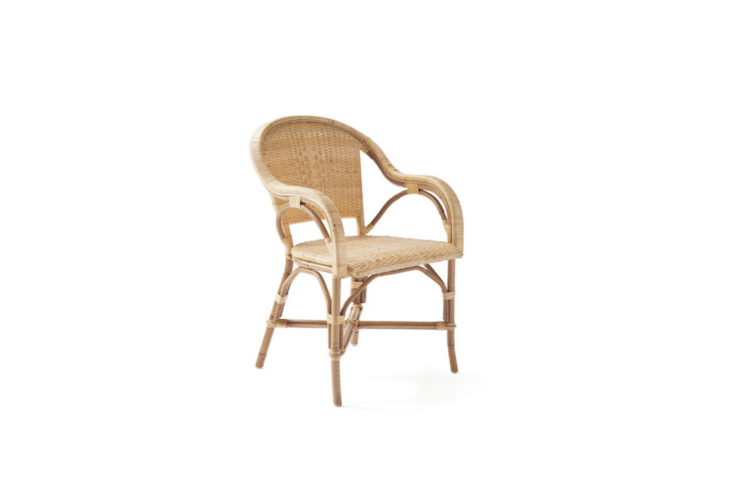 Above: A Sunwashed Riviera Armchair available in four colors (including Natural as shown) is $358 at Serena & Lily. 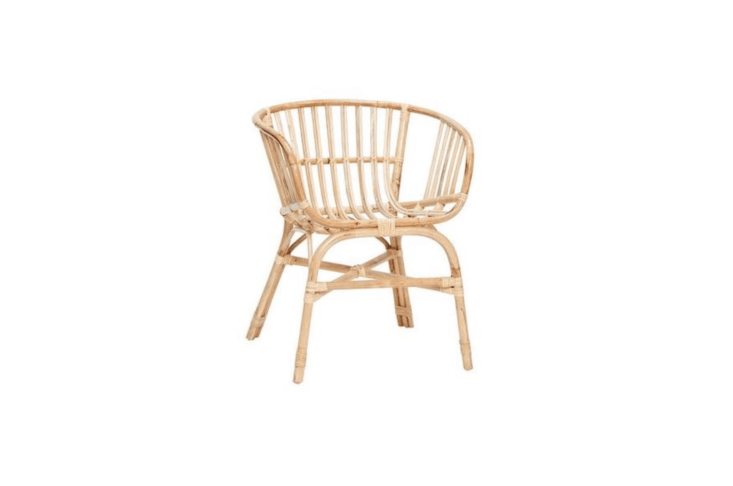 Above: A Broste Copenhagen Ulla Armchair made of natural rattan is €319.95 from Living and Company. 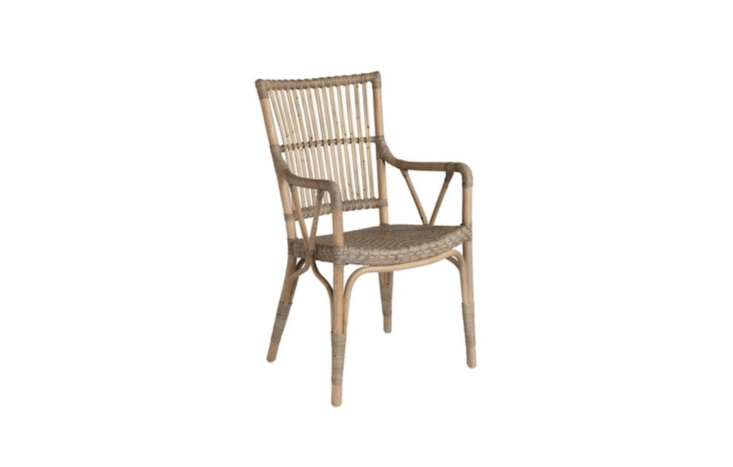 Above: From Denmark-based Bloomingville, a set of two Hubsch Rattan Chairs in natural is €375 from Living and Company. 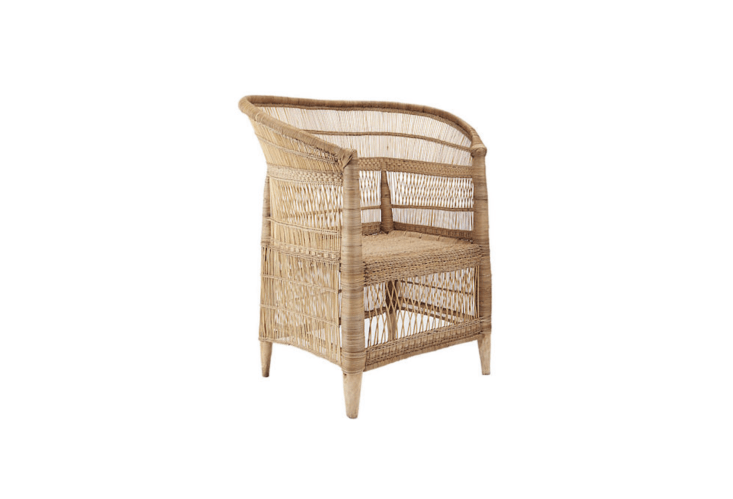 Above: A Brigitte Rattan Armchair is $195 from Kok Maison. Above: A taupe gray Piano Armchair is $425 from One Kings Lane. 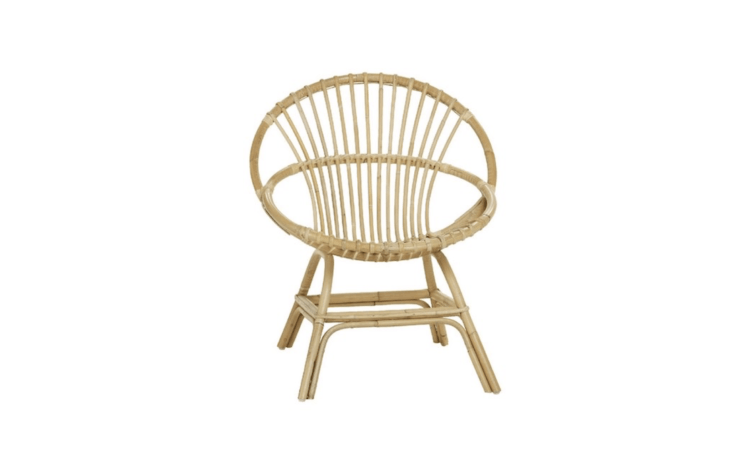 Above: A Venice Rattan Chair with a frame that was steamed and bent into shape by hand is $498 from Serena & Lily. 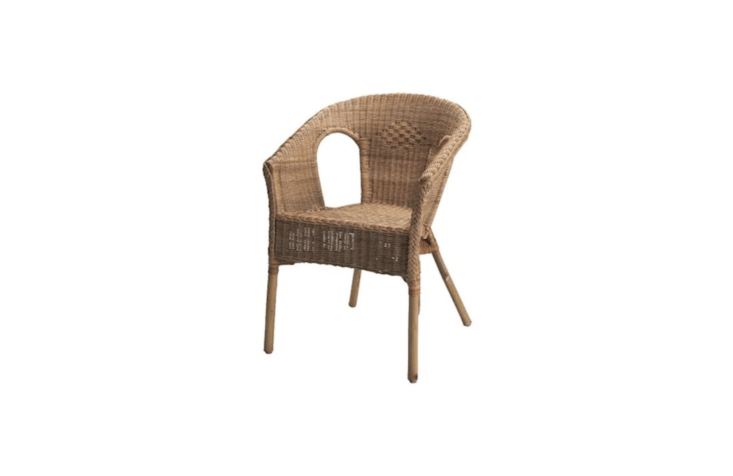 Above: Handmade of natural fiber, a rattan Albacken Armchair is $79 from Ikea. 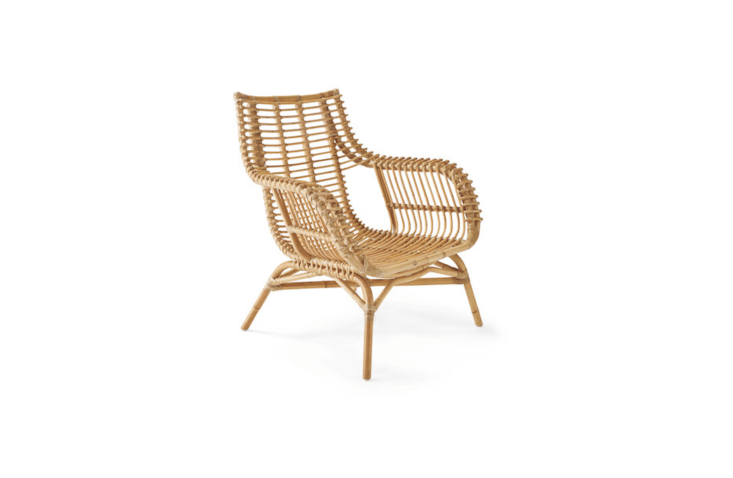 Above: A rattan Woven Malawi Chair is made with bamboo and has a solid blue gum tree wood frame; it is $399 from CB2. 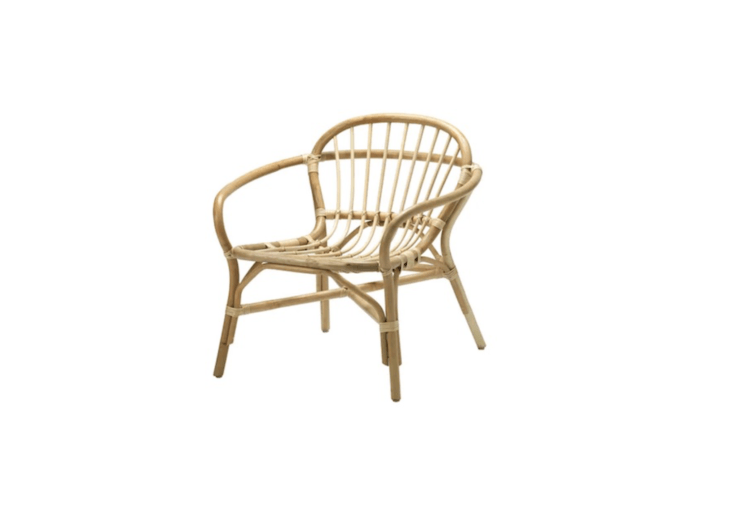 Above: A stackable, woven Agen Armchair with a bamboo frame is $79 from Ikea. 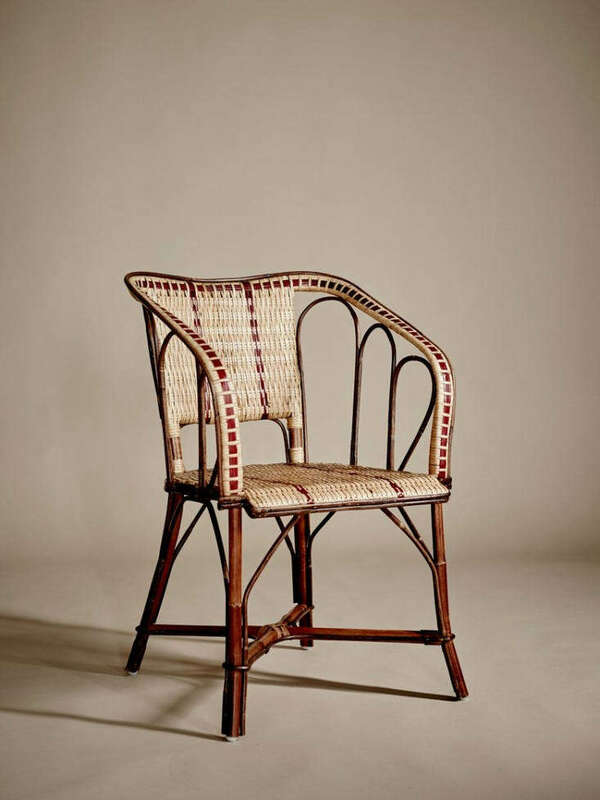 Above: Made of rattan, a Bagatelle Armchair “is a tribute to belle époque—the beautiful era—that took place in the last century, during which gardens, parks, and cafes are adorned by furniture in the same design language as these beautiful armchairs,” notes retailer Artilleriet. It is 2,550 SEK (about $275 US). Serious Energy Efficiency for SE Texas Hot Summer! As the winter months come to a close, it is time to start preparing for the hot days of summer that residents of Houston have come to know all too well. Triple Digit Temperatures are around the Corner! With temperatures reaching triple digits for weeks at a time, homeowners not only want energy efficient windows, it can be an absolute necessity. The professionals at Houston Window Experts can help you find the perfect replacement windows for your home and ensure that your house will be the coolest on the block. Engineers and manufacturers have made great strides in achieving the highest levels of energy efficiency in their windows. All the major brands have perfected the science of keeping the temperature in your home comfortable all year long. Finding windows that meet these standards does not have to break the bank anymore either. The professionals at Houston Window Experts will help you find top notch replacements that will fit any budget, not to mention increase the resale value of your home. With warmer temperatures outside on the way, your air conditioner will be turned on soon. If your windows are allowing your cool air seep out, your A/C will be running more. Choosing quality windows that are properly insulated and installed will keep those energy bills down. Savings on your utility bills can more than pay for the windows in just a short amount of time. Replacing the windows in your home can be a taxing project. Hiring professional installers will ensure that the units not only fit perfectly but will deliver the highest level of performance. HWE crews are highly skilled and certified to install their Houston energy efficient windows and homeowners can be assured that the finished product will be perfect and clean. The installation experts will be sure to clean the work area when complete and will make sure any furniture moved during the process is back in it’s place. If you are ready to replace the windows in your home, give Houston Window Experts a call. This family owned business is ready to jump into action to give the residents of Houston a cool place to come home to. Keep your cool air in and the hot air out this summer without running your A/C into the ground by calling the professionals at HWE, and you can relax in comfort during those hot summer days and nights.